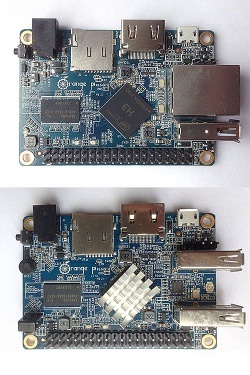 Orange Pi One and Lite are H3 based development boards produced by Xunlong. The One is clearly Orange Pi PC's little/smaller sibling. Compared to the PC the following is different: smaller size, 512MiB instead of 1GiB DRAM (still two DDR3L modules making use of the full 32 bit memory bandwidth), 2 USB host ports aren't exposed and the following is also missing: CIR receiver, microphone and TRRS jack for Audio/CVBS video. The Lite features RTL8189FTV WiFi (shipping with a small external antenna connected to the u.FL connector between the USB ports), saves the Ethernet port but regains one more USB port, CIR receiver and microphone. Xunlong chose a different voltage regulator on these two boards that requires software adjustments to get dynamic voltage frequency scaling (dvfs) working. Apart from that Xunlong tried to keep both small boards as compatible as possible to the PC so that all OS images for the PC work with One and Lite with just two drawbacks: Non functional dvfs without fex file adjustments and no WiFi without new drivers on the Lite. The H3 SoC support has matured since its introduction in kernel 4.2. Most of the board functionality for boards such as Orange Pi One & Lite are available with current mainline kernels. Some features (hw accelerated crypto, hw spinlocks, and thermal) are still being worked on. For a more comprehensive list of supported features, see the status matrix for mainline kernels. In addition, legacy 3.4 kernels are available in various work-in-progress git branches. Use the orangepi_one or orangepi_lite (supported since v2016.05/v2016.09) build target. The U-Boot repository and toolchain is described in the Mainline U-Boot howto. Use the .fex file for generating script.bin. Armbian maintains a bunch of 3.4.x patches for H3 devices. There you can also find the necessary patch set to support the new 8189FTV WiFi chip on the Lite. Since the manufacturer did not provide new fex files when Orange Pi One has been released in early 2016 you might want to use Armbian's (community developed) fex files: orangepione.fex and orangepilite.fex since they support the different voltage regulator on these boards, the new WiFi chip on the Lite and implement community derived improved THS settings (dynamic voltage frequency scaling and optimized thermal/throttling settings -- look at the dvfs_table and cooler_table sections in the fex files above). Use the sun8i-h3-orangepi-one.dtb or sun8i-h3-orangepi-lite.dtb device-tree binary. Both boards will fail over to FEL mode if it doesn't detect a card present in the µSD slot. There is no dedicated FEL button. [cpu_freq] ERR:set cpu frequency to 1008MHz failed! On the Orange Pi PC the SY8106A is accessible through I2C and the H3's AR100 OpenRISC core tries to adjust the CPU core voltage (VDD_CPUX) this way. On One and Lite a different voltage regulator is used: the SY8113B (datasheet) is a step-down converter that can adjust its output voltage driven by two resistors. According to Xunlong staff on OPi One this is used to switch between 1.1V at 624 MHz and 1.3V at every cpufreq above. Users that looked a little bit closer discovered that the similar AX3833 is used on the first batch of boards instead (see Gallery and link to datasheet below). DRAM is clocked at 672 MHz by the hardware vendor. But the reliability still needs to be verified. One of the ways of doing reliability tests may be https://github.com/ssvb/lima-memtester/releases/tag/20151207-orange-pi-pc-fel-test (developed for Orange Pi PC). An adoption of this using a fex file suited for Orange Pi One's/Lite's different voltage regulator is available here (md5sum: e600db41f94446bb77224223fc1dc2a0 fel-boot-lima-memtester-on-orange-pi-one-v3.tgz). Use the fel-boot-lima-memtester-on-orange-pi-one script inside to test both boards. User:Emsi88's Orange Pi One fel-boot-lima-memtester-on-orange-one-v3.tar.gz 696 MHz 720 MHz With small heatsink. 720MHz fails after ~2hours , 744MHz fails after ~25sec. Xunlong sells also a cheap 2MP camera (an attempt to fix the driver's limited resolutions can be found here). Unlike Orange Pi Plus/2 that can directly connect to the camera module for the Orange Pi PC/One/Lite an 'expansion board' is needed (see gallery below). If you order from Xunlong simply tell them that you need the camera for Orange Pi One or Lite and they ship camera together with the small board. The UART pins are located next to Ethernet / USB jack on the boards. They are marked as TX, RX and GND on the PCB. Just attach some leads according to our UART Howto. Please note that the boards are sold without any heatsink. This is just the tester's standard heatsink for all H3 boards now. At the moment only OS images relying on Allwinner's 3.4.x BSP kernel are available for the boards. Most of them suffer from wrong settings for the different voltage regulator used on One and Lite, the only known exceptions are currently the Armbian images and OpenELEC for both boards and WiFi support for the Lite. Xunlong also released a new Android image for the Lite that should support the new WiFi chip and also work with the One (just based on assumptions and not tested). In case you want to use other OS images with One and Lite be prepared to adjust fex settings to get thermal/performance settings right, that you need a kernel patch for the new WiFi module on the Lite and that all OS images except OpenELEC/Armbian use a horribly outdated kernel version 3.4.39 missing tons of fixes. This page was last modified on 4 December 2018, at 05:39.